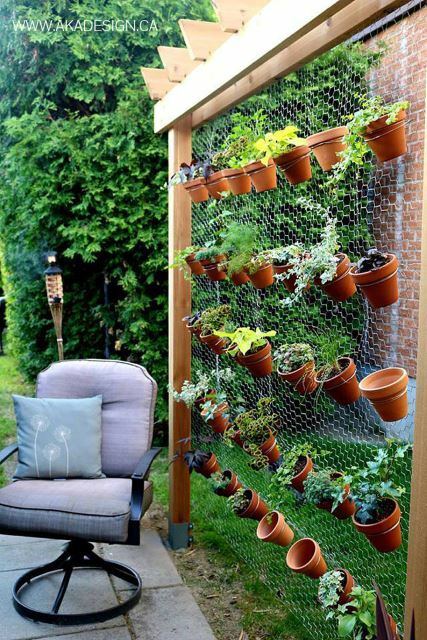 56 of the Best Vertical Gardening Ideas: #27 is Gorgeous! If you love gardening but don’t have space, you can easily scale down a garden that could fit in your own kitchen. 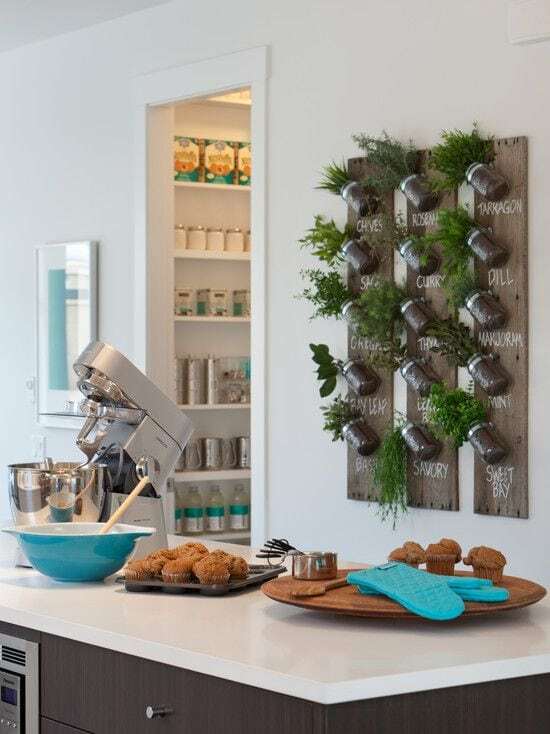 Vertical gardening is a great way to incorporate fresh herbs you can easily produce include in the kitchen. 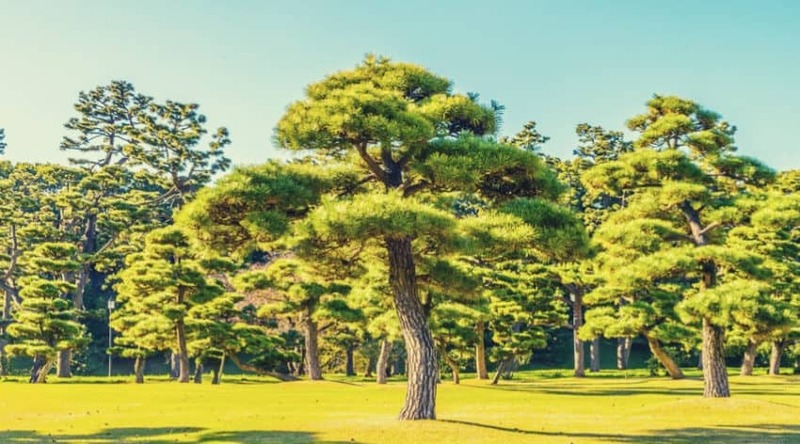 You won’t have to worry about traditional gardening tasks that include pest control, taking care of weeds and overall care. 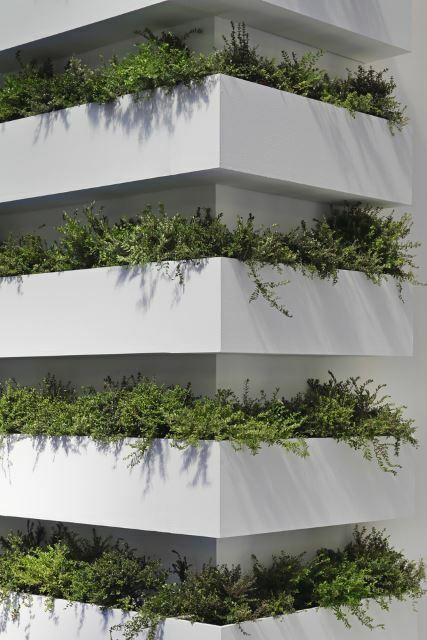 More and more people are utilizing vertical gardens because they are easy to take care of and even more fun to manage. Imagine being able to incorporate fresh basil into that pasta sauce you’ve been cooking up all day? 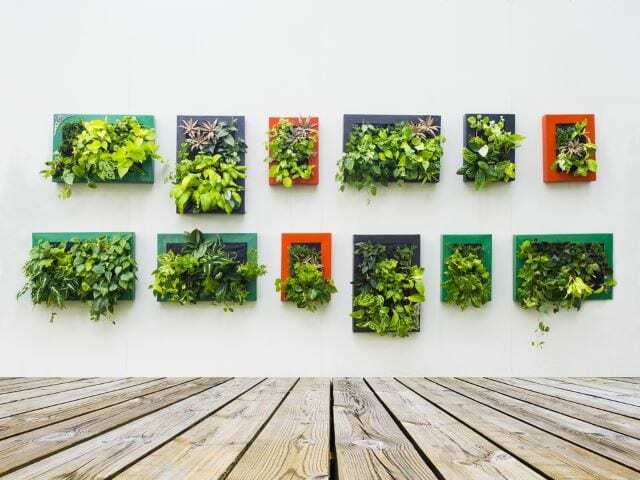 With vertical gardens, it’s super simple. 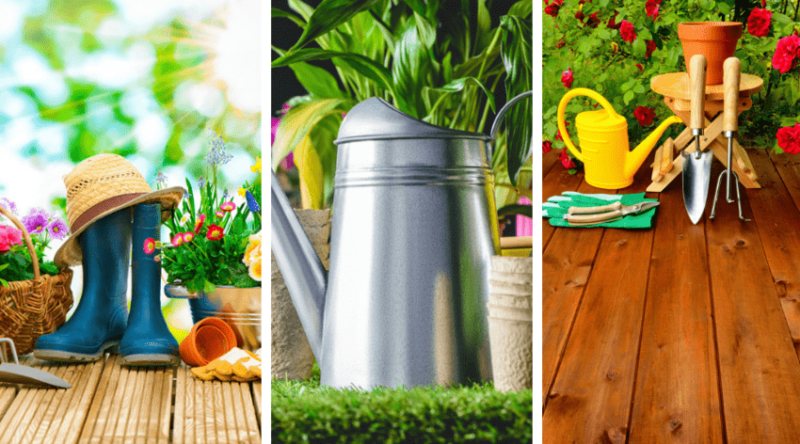 Here are some of the best ideas that we’ve found to incorporate a garden into your home. With this pocket planter idea, being able to care for individual plants is a cheap and easy breeze. Simply place seeds to whatever herb or plant you want into individual pockets to control the growth process for each plant. Since the seeds are all separated, it’d be easier to take care of each plant. This way, you can monitor each plant’s progress. What’s even better is that this is a self-watering construction. 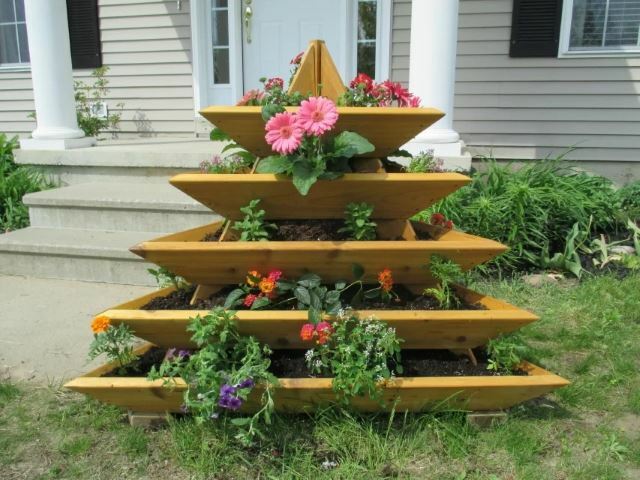 This creative vertical tiered planter is a perfect way to keep all your plants watered and healthy with minimal work. 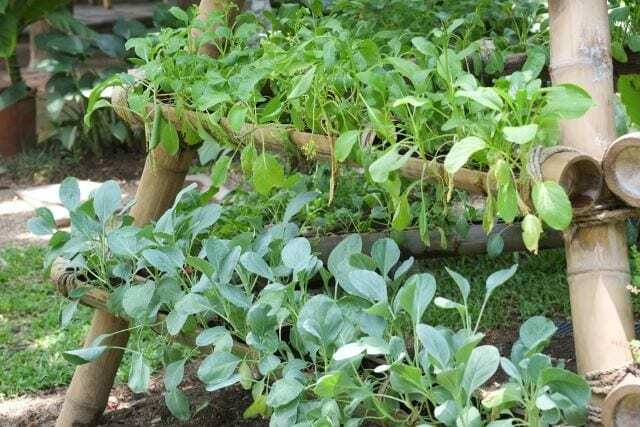 Since the system is dripping downward, all the plants will become saturated with water at the bottom., It’s a perfect way of leaving the guesswork out when to water which plants. This is also a really cute design that will look great in a kitchen or dining nook area. 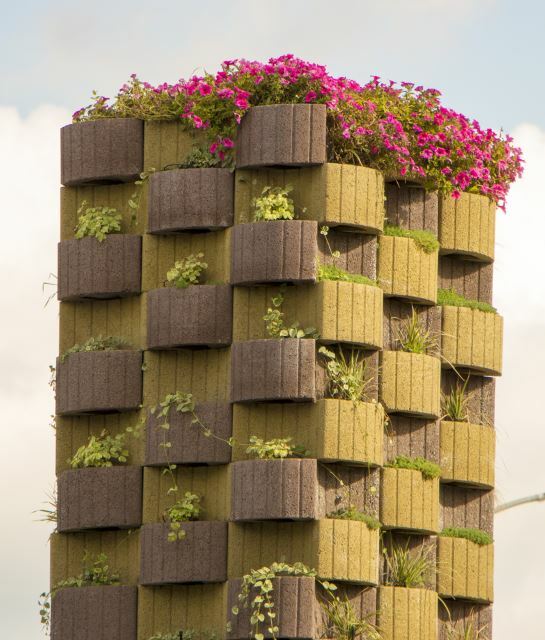 This vertical planter concept is not only interesting to look at, but it’s completely functional, too. The interesting design holds all kinds of different plants depending on preference. You can easily customize this planter to make it as large or small as you need. This would also look perfect in a small courtyard area or even apartment balconies. 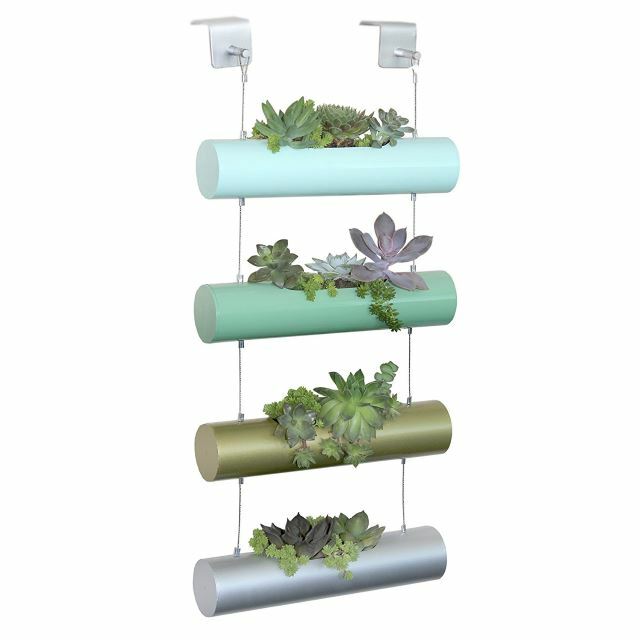 This plastic wall planter is a vertical oasis that can easily be constructed from repurposed materials. You could make this a fun project to execute with the kids or even just piece it together yourself. You could make this planter smaller so you can incorporate fresh herbs into it easily. 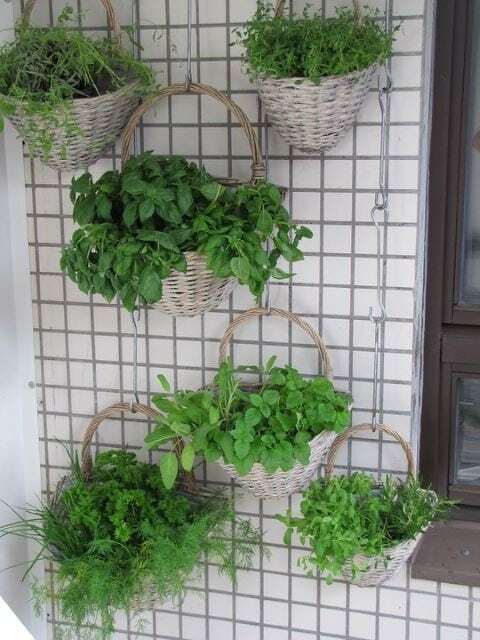 Herbs can basically grow in any container that has adequate dirt and water and displays them on a trellis. 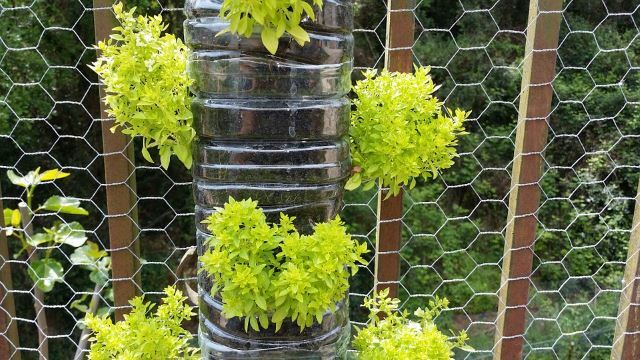 This vertical planter is made from a plastic water bottle or some kind of plastic reservoir. It’s an easy way to keep your herbs together without having to spend too much time on constructing an actual garden or planter. You can hang this concept up anywhere you’d like. I’s lighter in weight and can sustain plenty of dirt to get some of your favorite plants growing. 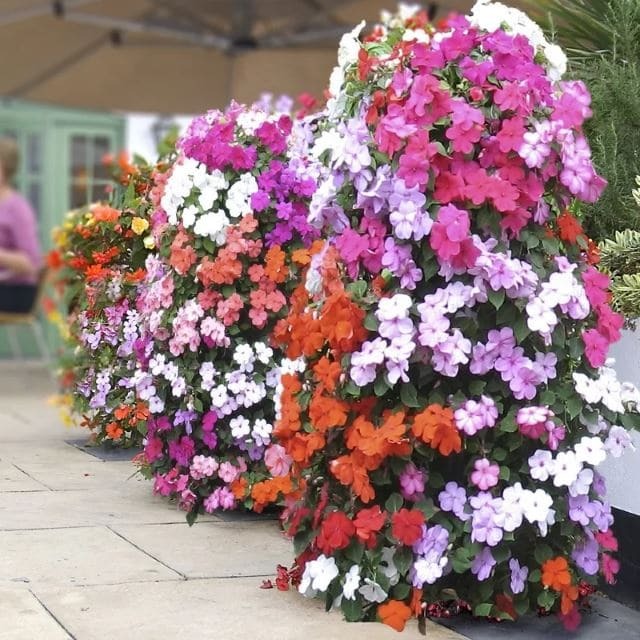 These planters are essentially hanging baskets. This is a really cute concept for planting a lot of different plants at once. It works as a great space saver since you don’t have to worry about planting the plants in an actual garden or in the dirt. It’s such a cute idea, you could even package this as a kit to give someone as a gift. Anyone who likes to the garden will appreciate it. This wall garden features squares of garden space. 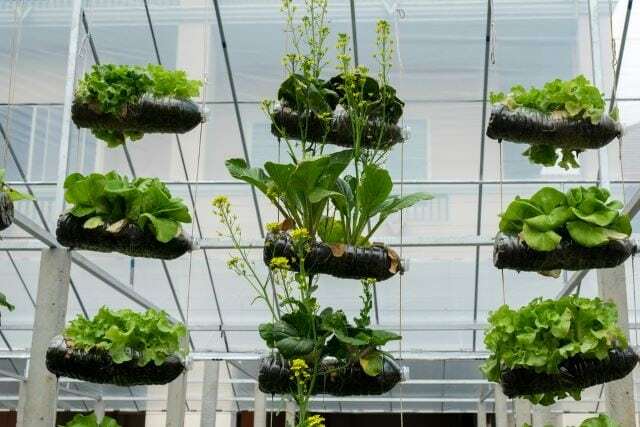 Vertical gardens means you can basically have a suspended garden in any sort of capacity you’d like. In this case, this garden is neatly packed into a wall space to add charm to any outdoor space. You can easily switch out the plants to match different holidays to add some extra interesting garden décor. This brick garden is a space saver that looks absolutely adorable. It’s a great way to incorporate a theme into your vertical oasis. The plants on the actual bricks complement the brick wall planters perfectly. This gives a well-rounded look when it comes to patio garden decorating. You can make these planters as small or large as you need, it just depends on preference. What better way to give life to your outdoor space than creating some living art? This interesting wall concept incorporates living plants in place of more traditional décor. This would be a great idea for an outdoor courtyard or even a side garden that has a back wall. The space is so chic that you could host your next party with confidence. 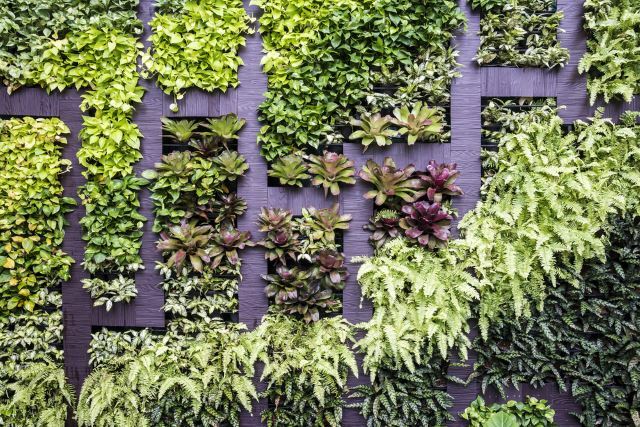 These wall gardens are on the larger size, but the larger the wall space, the more plants you can incorporate into the mix. The more interesting the plants, the more interesting the wall space will be. This concept would look especially great with succulents or air plants so that you don’t have to worry about watering them too often. 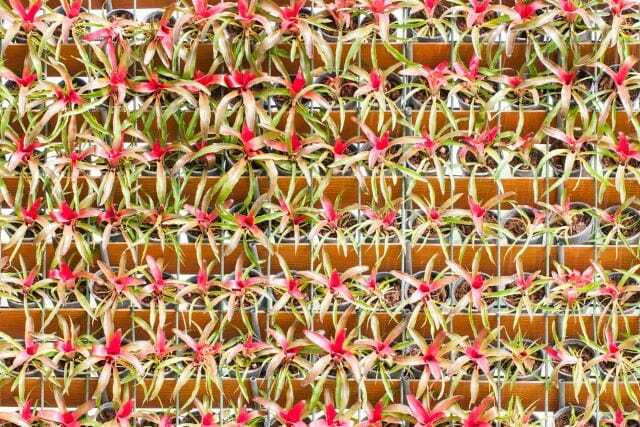 This wall features brilliant bromeliads in full bloom. 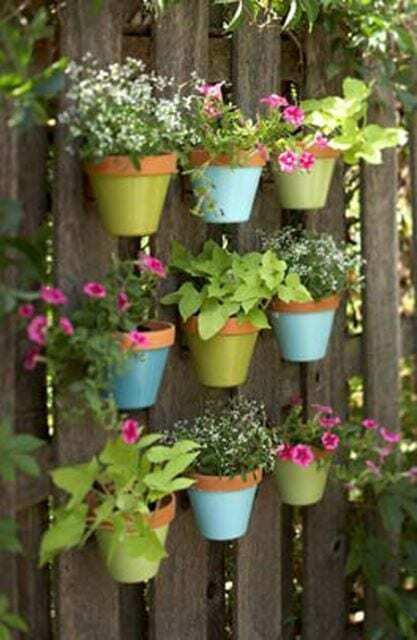 This is an artistic approach to creating your own vertical garden since it features solely flowers. Like air plants, bromeliads do well suspend because they draw most of their water from the air. 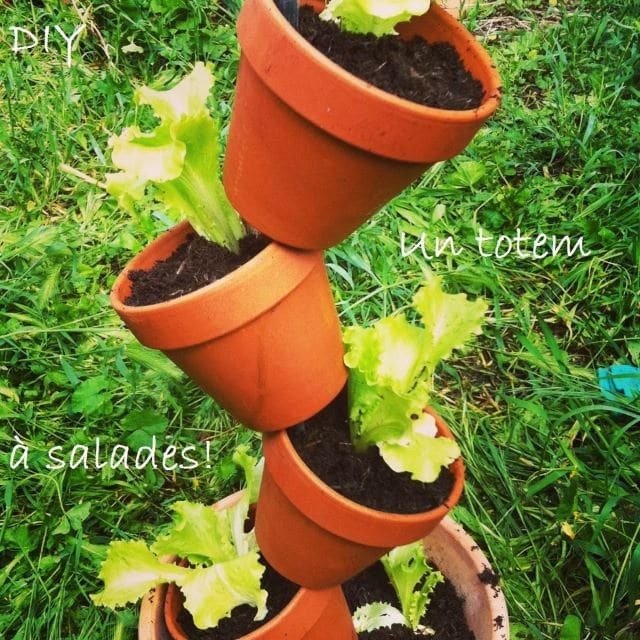 This is a great concept for anyone who often forgets to water the plants on a regular basis. 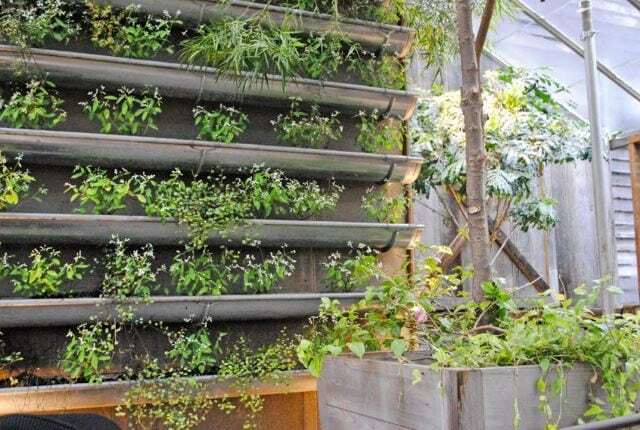 This rain gutter vertical garden is an interesting way to house your plants. Since the project requires rain gutters, it can easily turn into a repurposing project if you have some old rain gutters laying around. If you don’t have rain gutters accessible and can’t find any from a neighbor or friend, PVC pipe could be a decent alternative that won’t cost you too much. 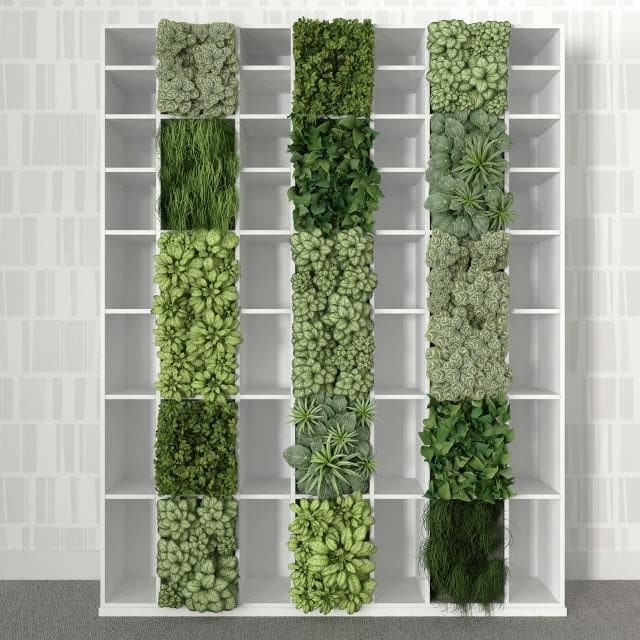 This bookshelf garden is a super cool way to create your own vertical garden with simple plants and moss. Since the bookshelf has spaces already in it, it’s easy to turn this into a vertical nursery. You can either set plants inside the specs or fill the actual spaces with soil and a crate. This photo depicts an interesting arrangement of green plants and succulents that makes the concept so unique. 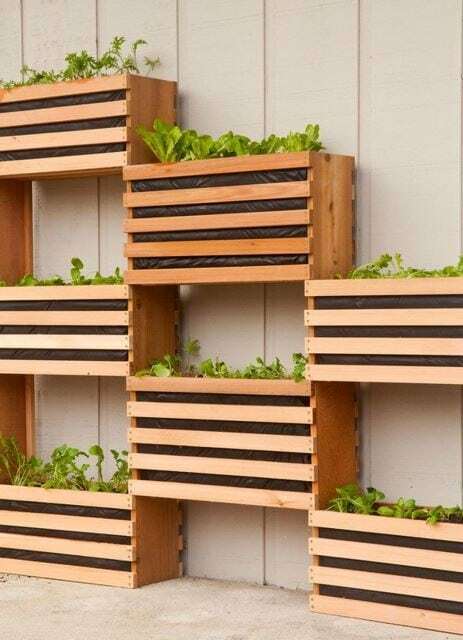 This vertical garden features plant boxes with slats. The slated containers give the space that extra rustic look with plenty of character. This is a fun concept in executing a vertical garden and you can easily adjust the size of these planters depending on the size of your outdoor area. You could even create mini slatted planter boxes for extra cuteness. 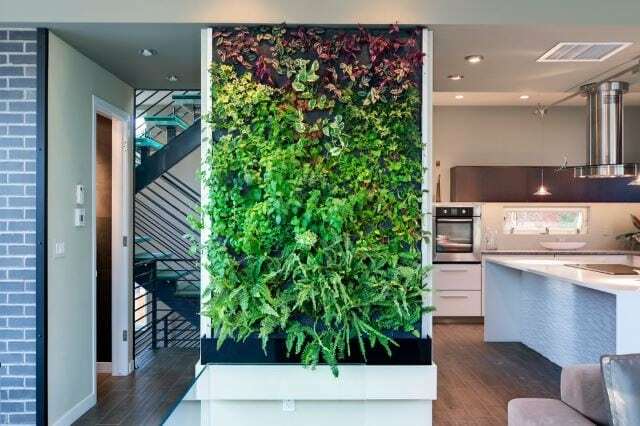 This interior design vertical garden is literally a work of art. The swooping rows of living plants make for such an interesting concept, it’s surprising you don’t see more of this in homes and businesses. The living art is a large display on this back wall and is definitely an eye-catcher. The contrasting colors make the vertical oasis even more compelling to look at. Here’s another gorgeous example of a garden wall. These blooms burst brilliantly open so anyone who passes will be sure to notice them. This is a great way to add some life to the mix or even change up an outdoor patio area. Bromeliad-like flowers like these look great and are easy to take care of since they require minimal watering. This corner vertical garden features a sort of triangle shape space for these plants to grow. This is a great idea when you’re trying to utilize space and add some interesting effects without taking too much room. 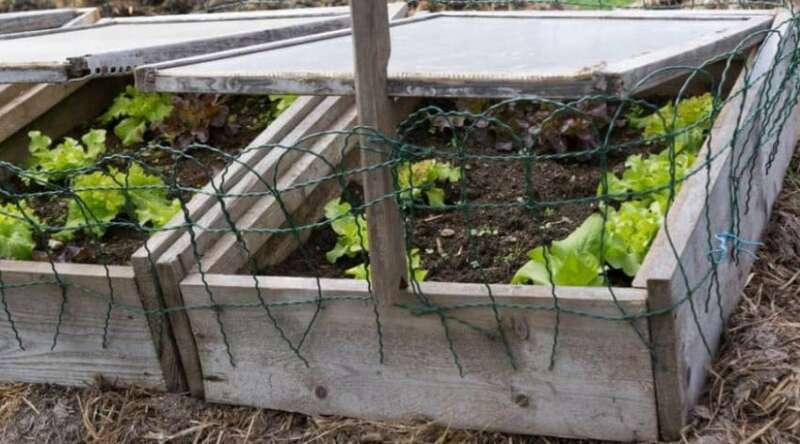 This is also a great concept for anyone who lives in an apartment or townhouse area since these spaces don’t commonly have adequate gardening space. This brick wall vertical garden is interesting because of the shape. This adds some height and intrigue to the outdoor space since the flowers are sprouting out of the top of this construction. The varying bricks help make this structure so interesting to look at while providing an aerial garden that all visitors are sure to notice. This is an interesting way to add some plant life to the outdoor space. 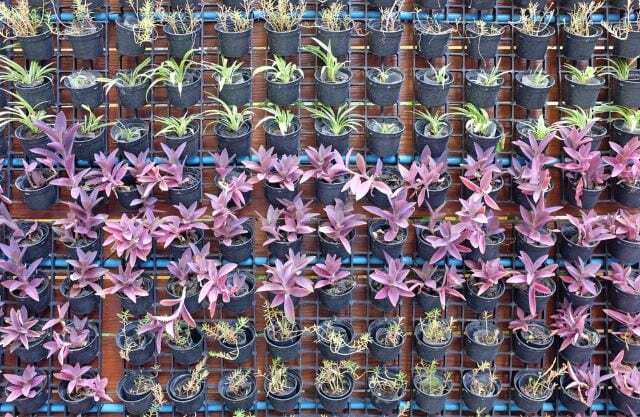 Recycling old plastic bottles and turning them into planters is a great way to add a vertical garden scape into your patio or courtyard area. 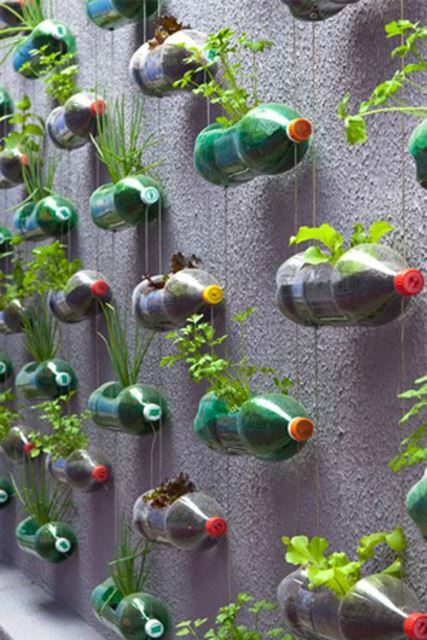 You can simply hang these planters against a wall and plant all types of herbs and succulents into the bottles. This is a fun way to start an herb garden without having to worry about traditional gardening and pots. This vertical oasis features interesting shapes with plants. The rows cut into the green living plants and make an interesting feature to this outdoor scene. Imagine having an outdoor barbecue with this gorgeous vertical creation in the mix. Your outdoor patio area would be the hippest place on the block and you’d easily be able to gather friends and family for more outdoor events without the hassle of having to decorate. 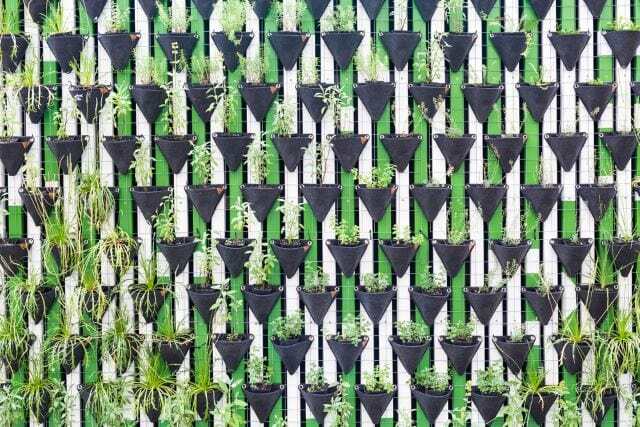 These tiny pots line this wall to create an interesting vertical garden. You could fill these tiny pots with almost any plant you’d like, but it’d be really cool to have an herb garden in this format. Since the pots are so tiny, you don’t have to worry too much about suspending them since the weight won’t be significant. It’s an interesting concept to a standard vertical design. 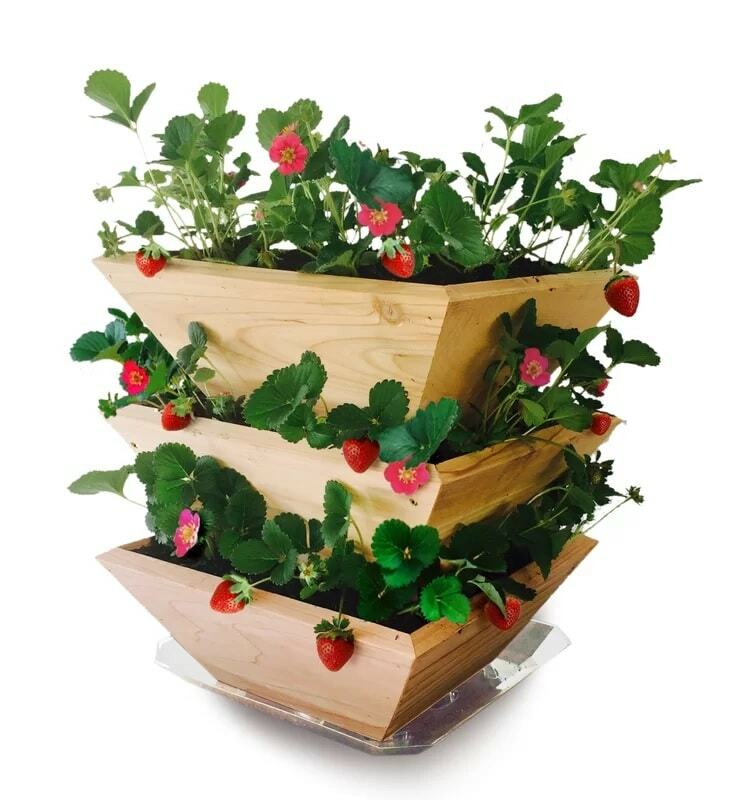 These vertical strawberry planters are, obviously, growing strawberries but if it isn’t strawberries you want, you can easily switch out this type of planter to any kind of herb you may want. You could even try cherry tomatoes since these are also vining plants that tend to favor being able to grow down. If you do crave fresh strawberries on a regular basis, though, this is ideal for you! 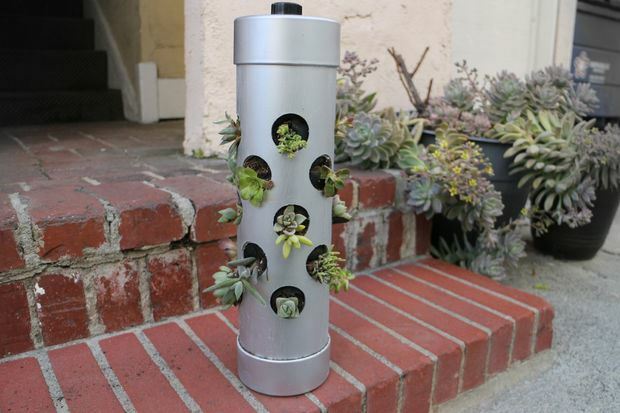 This green vertical garden scape features tiny cones for the plants to grow out of. 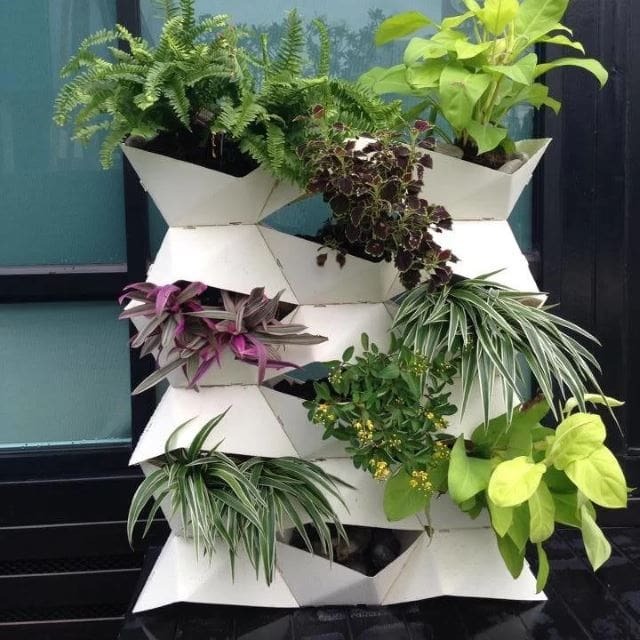 Instead of traditional mini pots for this vertical garden, these coned planters can be used in order to provide more nutrients to the plants. These cones are typically made of peat, which is life sustaining when it comes to tiny, new plants such as these little guys. This gorgeous garden space is located right in the kitchen. Although it is in the kitchen, you don’t necessarily need to equip this space with herbs, but how awesome would that be to be able to start cooking and just turn around to cut some fresh herbs for that pasta you’ve been working on? Fluorescent lights could be incorporated to make sure the plants are happy and healthy. 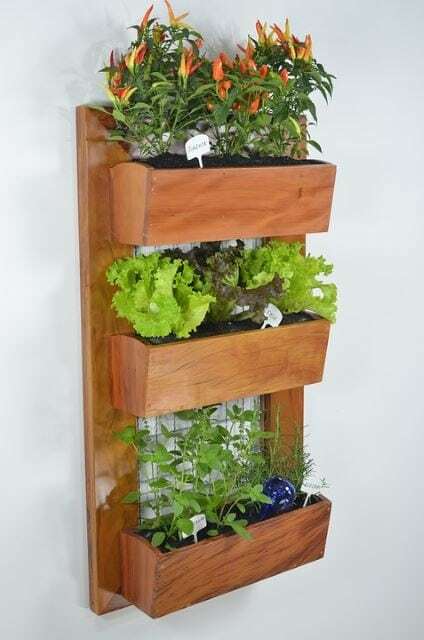 This hydroponic vertical garden is a great way to start your very own vertical garden since it’s self-watering. 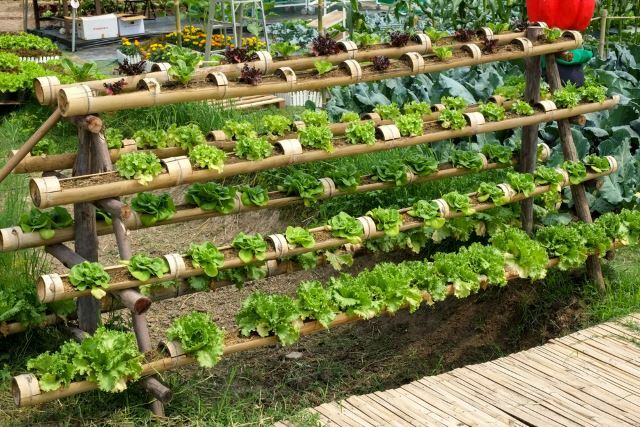 The hydroponic system helps deliver water and nutrients to plants so that half of the work is taken out of gardening. This system comes in many different formats, but they all relatively provide the same thing. This wooden vertical garden resembles the previous teak-style wooden planters we saw. This mimics that PVC pipe or rain gutter idea, which makes this concept so easy to use and really cool to look at. Since the structure is unique, you can easily incorporate this into an outdoor courtyard or side garden space in order to provide some really interesting focal pieces. 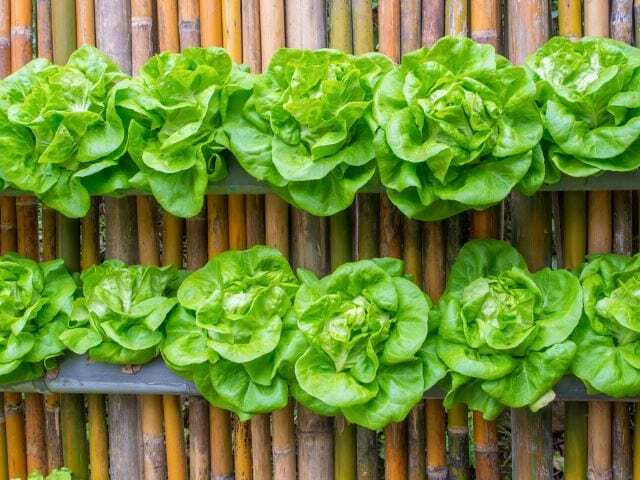 Obviously, you can have a vertical oasis that grows any type of vegetable, but this vivid green lettuce looks super great against this wall. 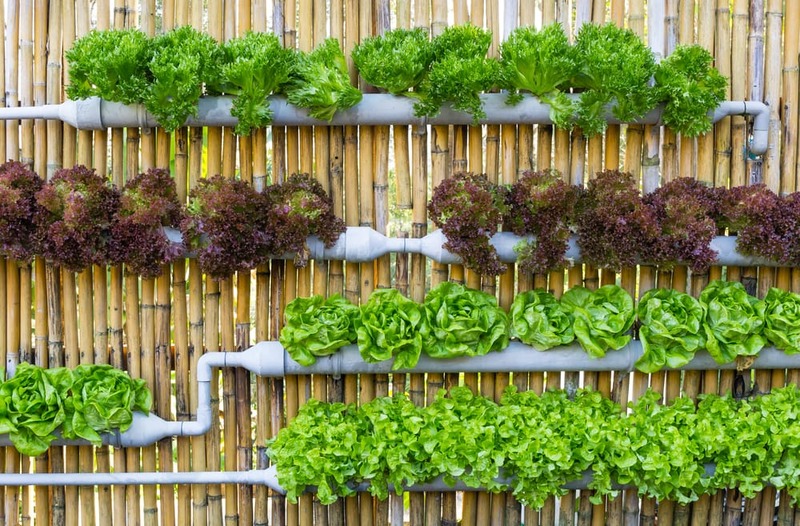 You can use the same rain gutter or hydroponic system we saw earlier to create your own vertical gardenscape. Some vegetables may do better than others when it comes to growing them on a wall, but you can pick and choose.y interesting focal pieces. This is pretty much a living, flourishing kitchen salad! This walled garden features some of the best things you could grow within a kitchen setting. I see fresh herbs, an array of lettuces and other vegetables perfect for cooking with or throwing into a fresh, summer salad. Impress your guests at dinner parties with fresh veggies and herbs grown in your kitchen! 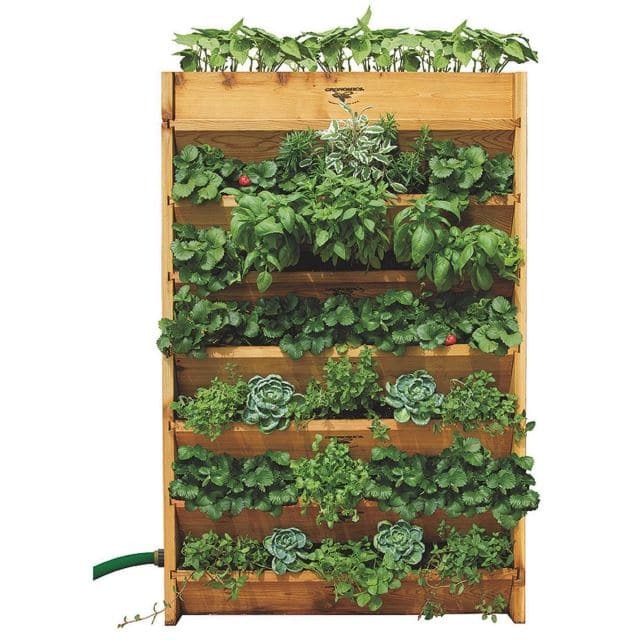 These vertical crate gardens are a super cute way to have your vertical garden neatly organized. 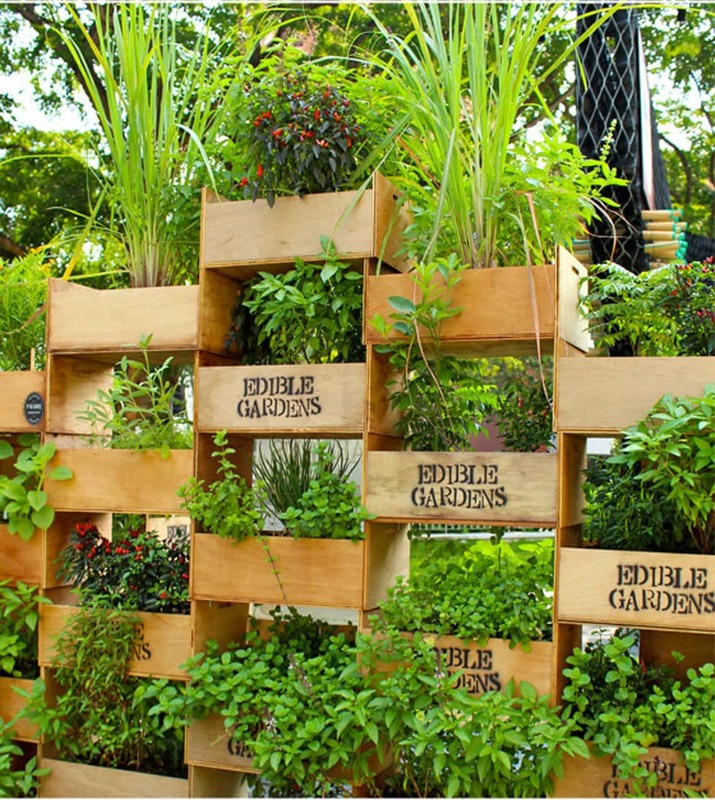 The crates can easily be stacked on top of each other in order to create a sort of garden wall that is much different than those other concepts we’ve seen. This way, you can label each crate so there’s no confusion as to what you’re planting where. 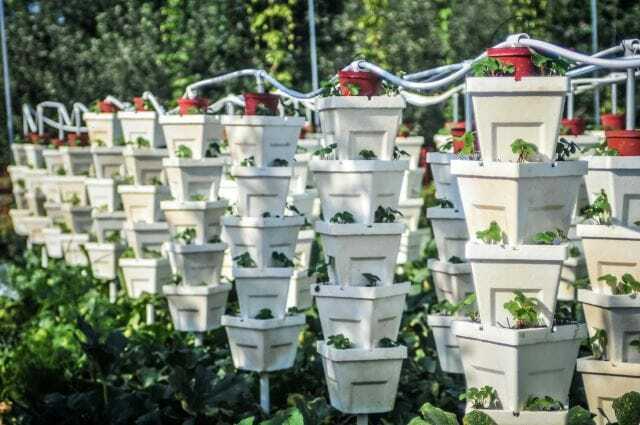 This adorable strawberry patch tower is a neat spin on the standard vertical gardenscape. This setup almost resembles stacked bowls with strawberries deliciously growing out of each one. Strawberries do the best when growing down, so this concept is just a different take on what strawberries favor. Plants like tomatoes will also grow well this way. 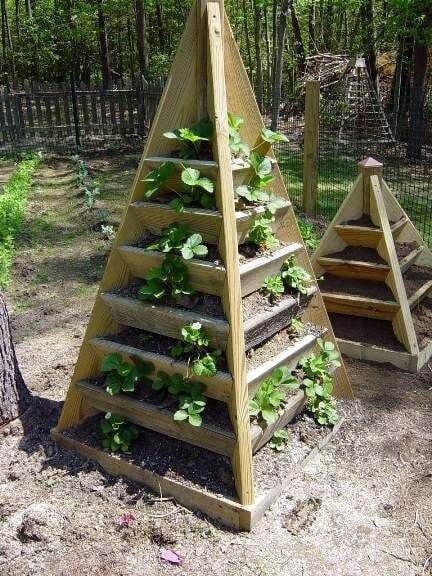 This garden pyramid is not only super cool to look at, but it’s entirely functional. 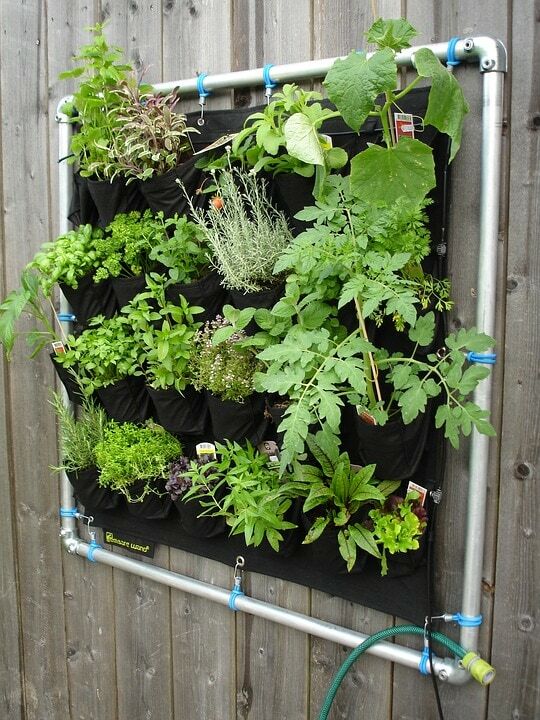 What a neat way to create your own vertical garden scape and keep everything neat and tidy. 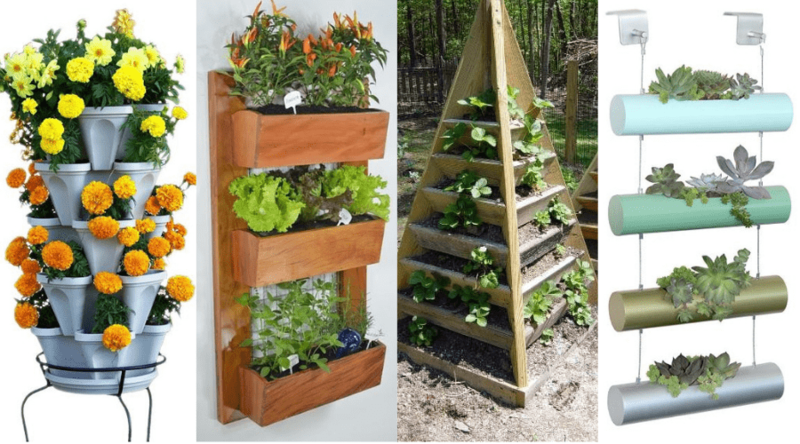 You can easily organize the shelves to this pyramid by product type or flower type, or if you’d rather house an herb garden in the structure, this is an easy way to make sure the ones that require most sun are at the top. This vertical oasis features herbs growing out of mason jars. This is a super cute idea and wouldn’t take that much work to create yourself. 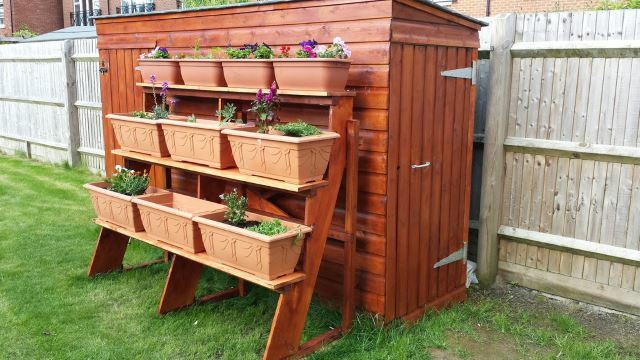 All you’d need is a board with pegs, some jars, some planting stuff and voila! 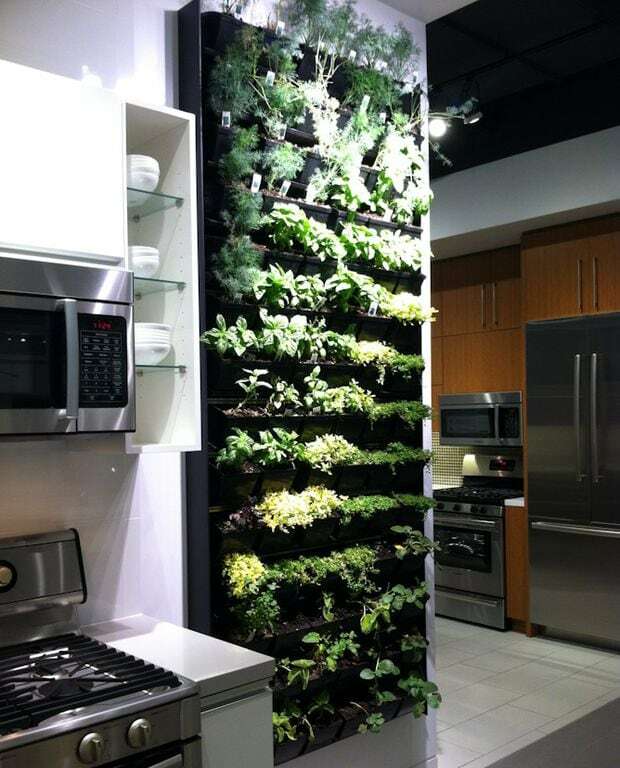 Your next kitchen vertical gardenscape is that simple. 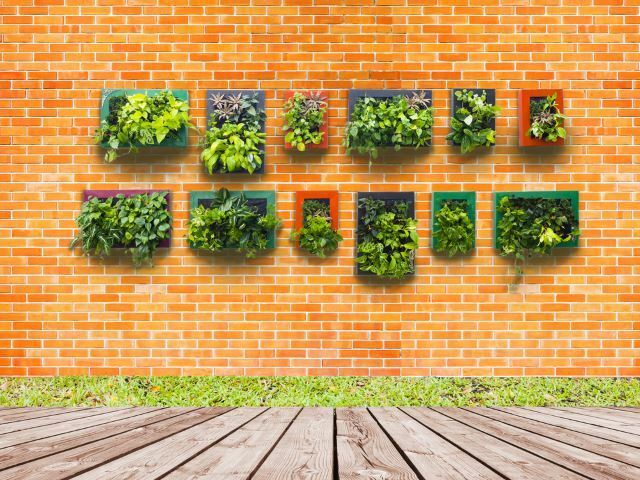 This would also make a neat project to get the family in on or you can gift the set to someone so they can set up their own kitchen vertical garden. 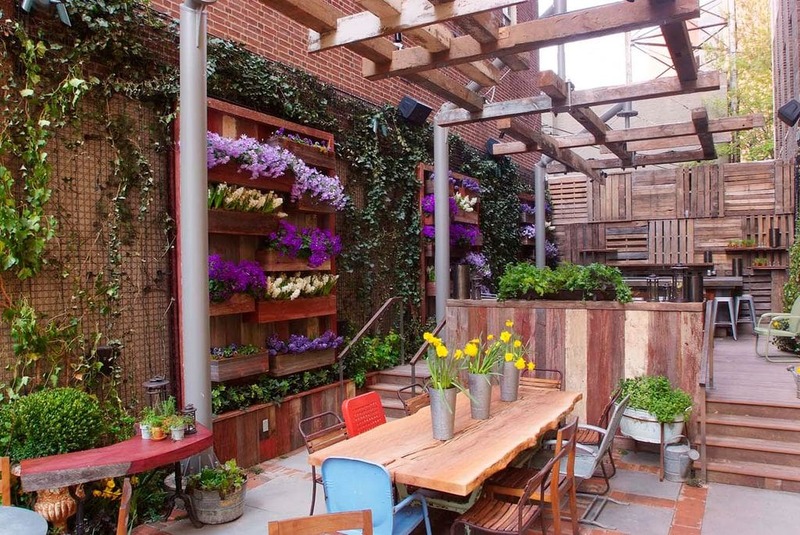 This rustic patio features beautiful vertical garden walls with all kinds of different foliage. The whole look of this patio has been completely revamped with the life the plants have brought to this space. You could use all types of plants with space this large, but you can also scale it down if you needed to. This is a gorgeous way to have a vertical garden suitable for entertaining purposes as well. 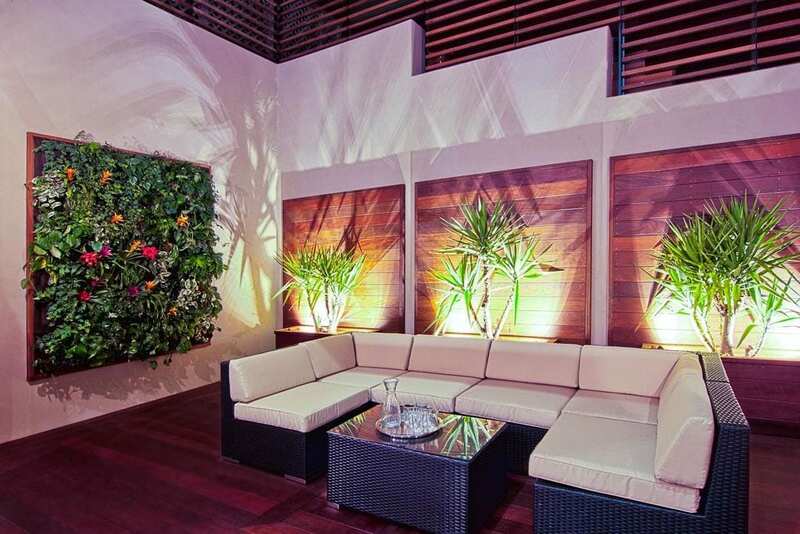 This contemporary patio features floor to ceiling plants. 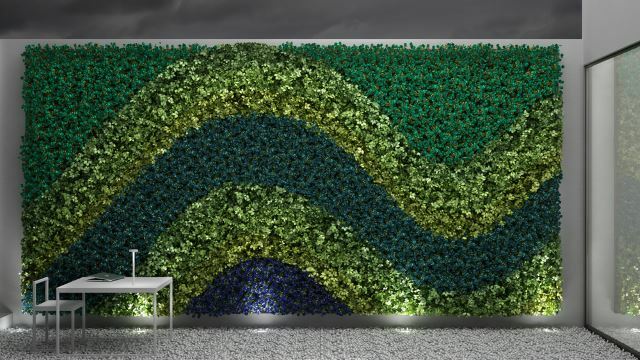 These creeping vines easily adhere to wall surfaces to create this living wall that looks polished and astounding at the same time. Having an entire wall garden is a great way to dress up a patio without having to add too much to it. 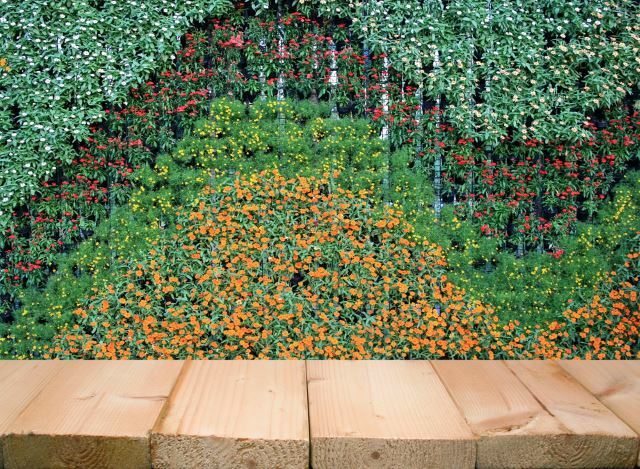 If you can have multiple walls with this great gardening effect, the look will be even better. 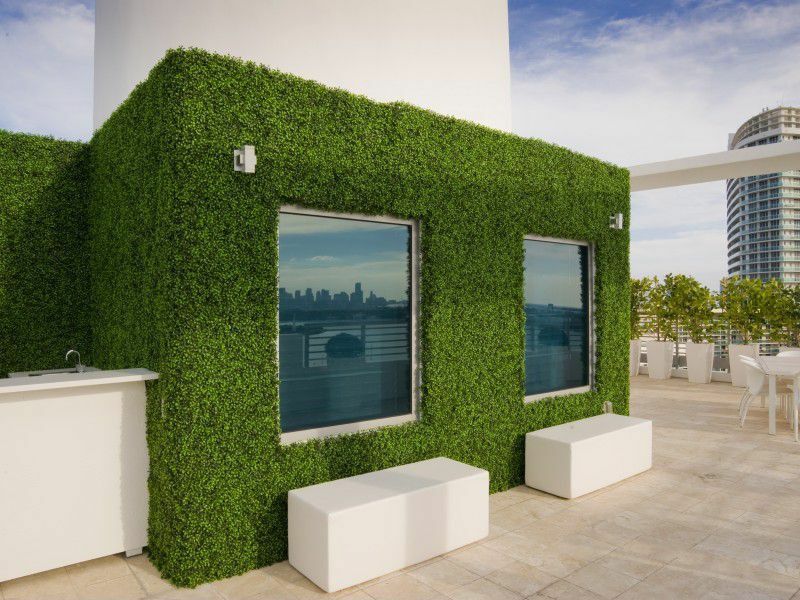 This patio wall features a swooping design that was prevalent in other indoor vertical garden scape design concepts. Adding some design to the wall is a great way to change it up and add some interesting textures and colors to the mix. You could create any design you’d like, just be sure to use a guide before starting to plant seedlings. This patio is ready to go for any upcoming cocktail parties. The pop of color from the side vertical oasis is the perfect element to make the scene look tropical and inviting. The lights pair along with this scene perfectly, and if you need a nightcap after a long week, this would be the perfect place to do so. Be sure to have plans on gathering friends once you have your patio area set up like this one. This small vertical nursery features plenty of tiny plants peeking out of their designated pockets. 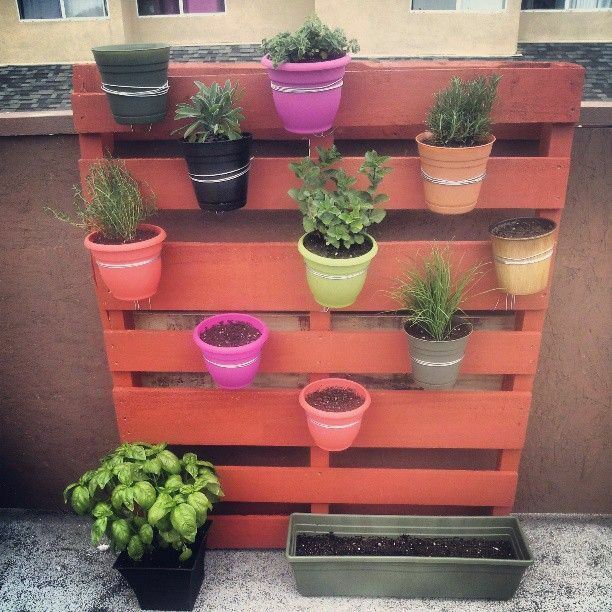 This is a cute way to make sure you have your fresh herbs even if you don’t have the garden space to do so. The pockets contain all the nutrients these tiny plants would need and they are absolutely adorable to look at. This would look perfect in a kitchen area. 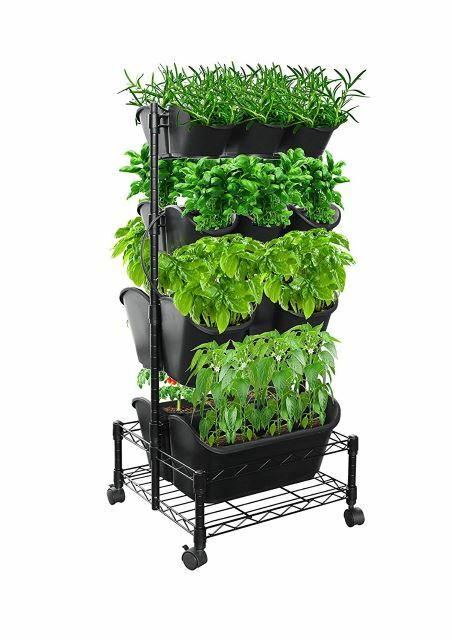 This stacked garden is the ideal way to incorporate fresh plants into the patio area or home area. The wooden panels pretty much act as a garden box, one that you’d find on a windowsill or along a garden edge. This setup is perfect for planting little plants that can be kept indoors or under a covered patio. 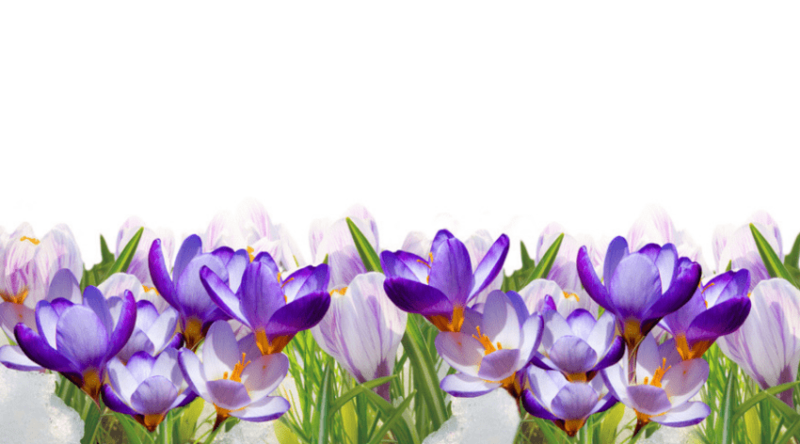 They are easy to water and will grow all year long. These pillared planters are super cute for flowers. In this picture, the tiny little flowers look like rounded mounds of blooms thanks to these nifty planters. These would be perfect for a small patio area or even an area right outside a front door. Whatever the case may be, these planters would make it easy to have multiple plants in one. These may just be multiple colored planter boxes, but you can pretty much call this set up an art piece. 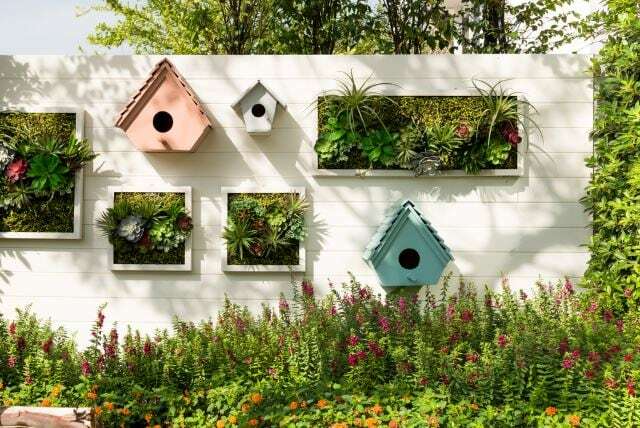 These gorgeous little containers make the wall pop with color and will create a gorgeous vertical gardenscape setup for the outdoor space. You can use any colors you like to incorporate them into your pre-existing patio decoration setup. This boxed hydroponic garden is a perfect way to take care of all your plants at once. 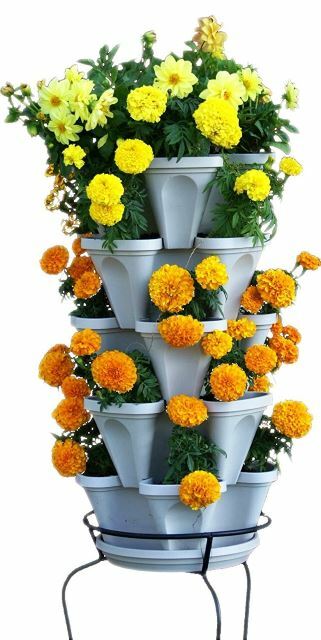 Since this vertical garden is so easy to take care of, you could easily put this on a porch or corner garden area. If you choose to plant fresh herbs, you should keep this wonderful little planter close to the kitchen door so you can pop in and out of the house to collect fresh herbs year round. This hanging plastic planter features a few of these wonderful containers ideal for planting small plants. Since this is a hanging planter, you can hang this anywhere in order to grow fresh herbs year round. These planters look great because they’re smaller and would look great on a patio area. The colors should vary to match any décor you have. This wheeled planter box features several bins for you to plant herbs or vegetable plants in. Since it’s on wheels, this could be easily moved from an outdoor space to the kitchen if you so desired. This is an easy way to keep track of your plants and allow them to get sun and yet bring them indoors if you needed to. These cute little plants are growing out of a hanging pocket wall. 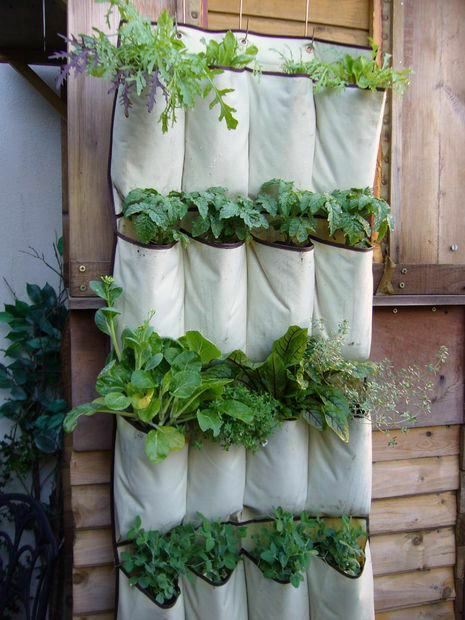 This is a great way to be able to plant plants anywhere since they virtually drape over anything available. If you prefer to plant herbs, you could easily take care of herb plants on a patio or side garden area. The plants you use would have to be smaller so they have plenty of root space. These tiny hanging pots are adorable and functional. They are adorable to look at and you could easily make this a fun project for kids. You could help them paint the pots and it’d be fun to teach them about how plants grow. There’s just something magical about planting seeds and watching tiny seedlings sprout. This tiny pot wall features a lot of those same pots we saw in the previous image, just more of them. It would be easier to hang all these tiny pots on a sort of chain link fence such as this one. If you have an outdoor sitting area, this would be the best idea since you’re both growing your favorite plants and creating an outdoor space. 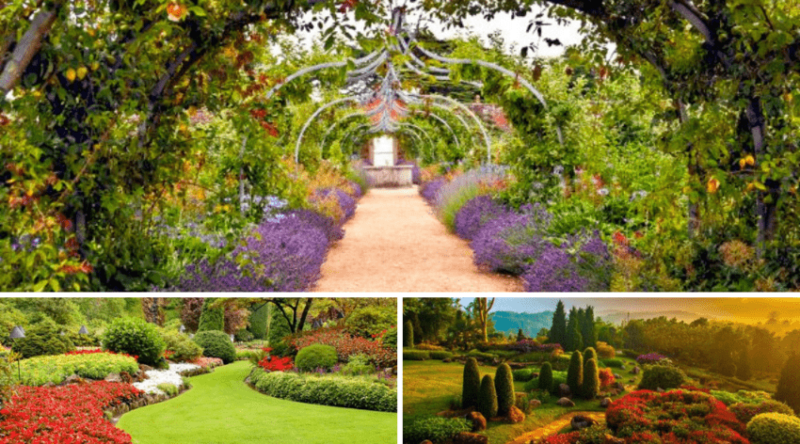 These garden concepts are so gorgeous to look at! Just look at all that vivid blue and green! 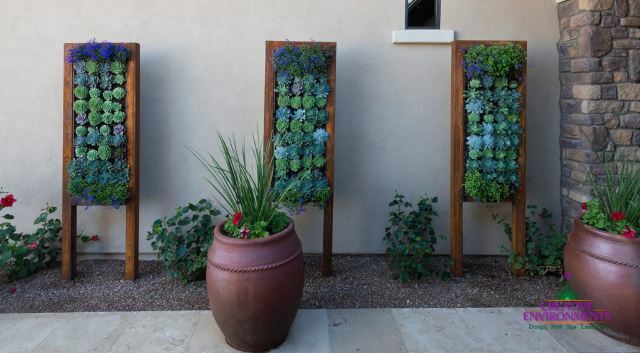 This is a different way to incorporate vertical panels into the outdoor space. These almost double as a sort of garden artwork or fixture. Depending on your preference, you could use any type of color scheme you like. This may be my favorite idea concept out of all of these. 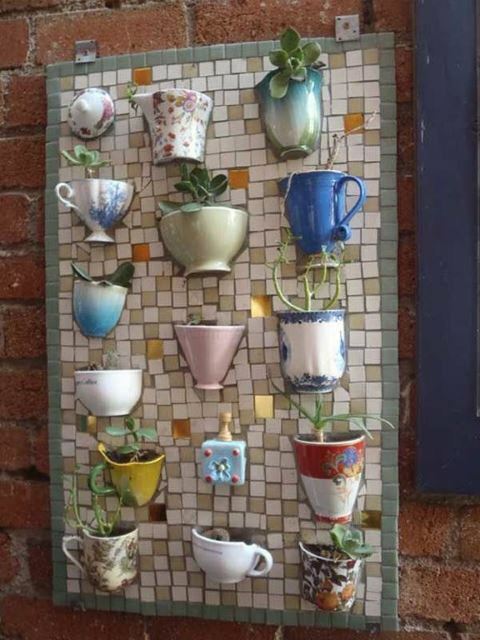 These super adorable little coffee cups and/or teacups make the perfect vertical wall garden design. These little cups are the ideal size to plant some fresh herbs and maybe even some tiny budding plants that produce roses or other smaller blooms. This is a super cute idea and would look great in a patio area. 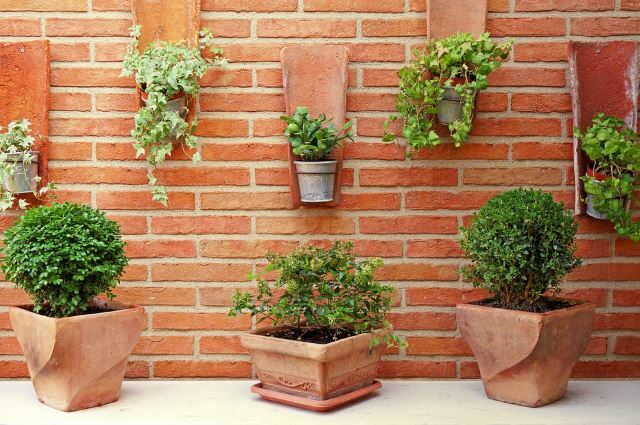 These topsy-turvy pots are the cutest way to create a vertical wall garden perfect for the front porch or patio area. You can get as whimsical as you’d like with this design concept since this would also make a great do it yourself project fit for the entire family. You could even throw one of these together as a kit and gift it to someone you love. This stepped planter do it yourself tutorial shows you exactly how to incorporate a stepped vertical garden setup ideal for your perfect planters. In this concept, they make use of a garden box than an actual garden pot, but you could easily mix it up to fit your garden needs. This is a great way to have the plants you want without having to tear up the backyard making garden space. 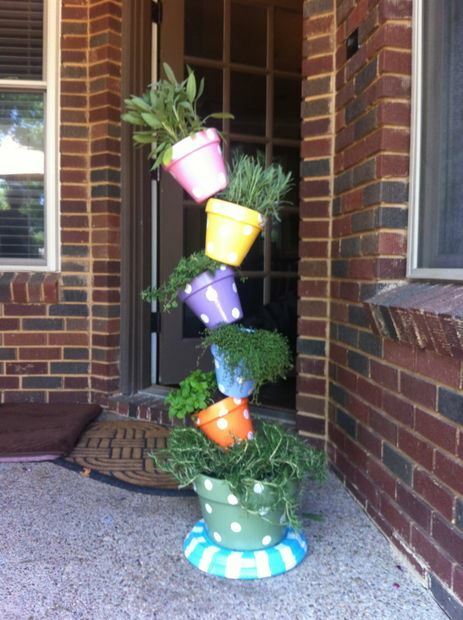 This DIY vertical garden shows you exactly how to make that topsy-turvy planter we saw in the previous image. The steps are relatively simple and can be made easily to give away as a gift. If you are going to gift this planter to someone, you could easily include some seedlings and a bag of soil to make this an all-inclusive gift package. 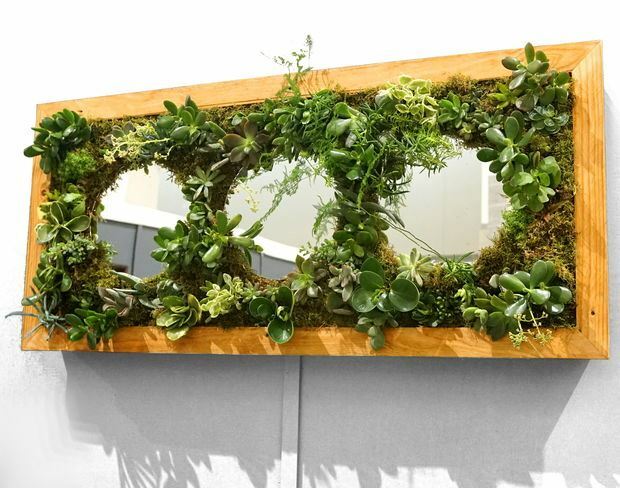 This vertical wall garden board features large circles cut out into the middle of it. This makes the board interesting to look at as well as highly functional as far as planting goes. If you’re looking for a different design concept, this could be the next thing you decorate your patio garden area with. It’s a great design and the plants look gorgeous in this setting. This picket board is a bright red while the tiny colored pots beam out in color. This whole concept is great, but the use of color here is what really brings this design concept out of the norm. 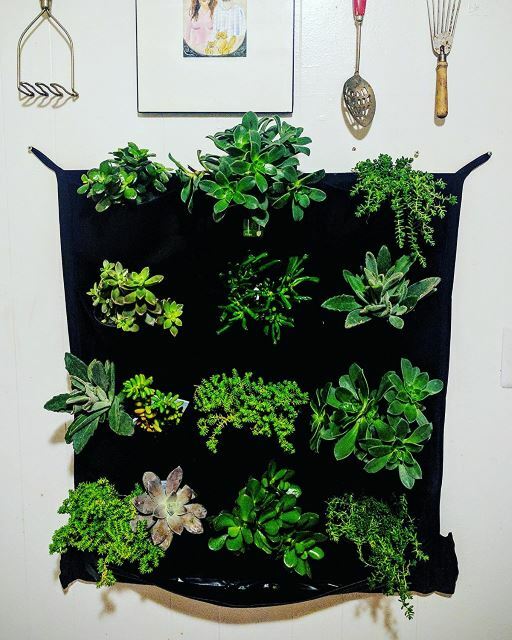 You could easily incorporate some of your favorite colors into the mix to create a bold vertical wall garden board that everyone will be asking you about. This super neat pillar planter has a few small holes cut out of it just big enough to allow tiny herbs to come peeping out for some mid-afternoon sunshine. This concept kind of looks like a bird feeder design to me, since the holes, make it easily accessible for plants to get water and sunshine. You can easily hang this on a porch or outdoor garden area. So, there you have it. So many great designs to choose from! But the question is, which design are you going to try out for yourself? Have a few concepts that you like but aren’t sure how to incorporate them into your outdoor space? Mix and match and see what works out best for you! 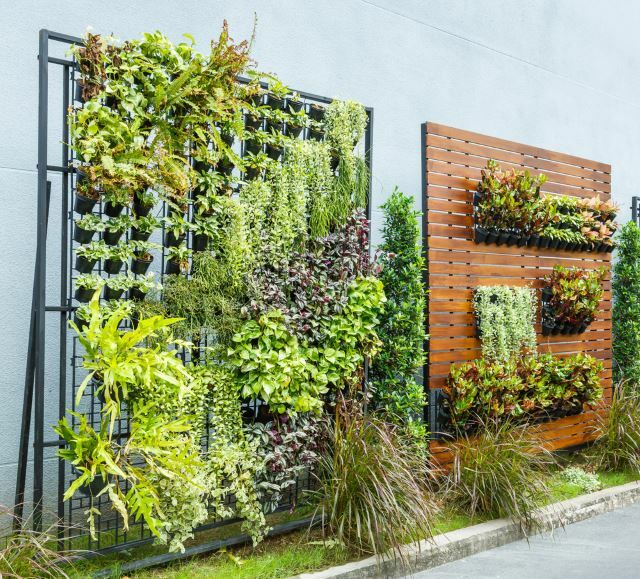 If you have any comments on vertical wall garden designs or if you have experience with your own DIY project, please let us know in the comments! 88 Gifts for Gardeners: Fabulous Finds You’ll Want to Keep for Yourself! 49 Awesome Garden Landscaping Ideas: #28 is Gorgeous!